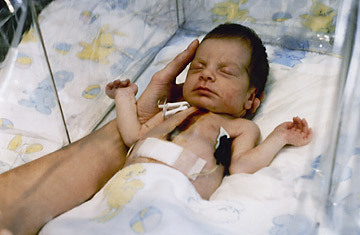 Twenty-five years ago on Nov. 15, Baby Fae's world-famous heart stopped beating. But the medical implications of her short life, said her surgeon, Dr. Leonard Bailey of California's Loma Linda University Medical Center, were just beginning. On Oct. 26, 1984, Bailey had stitched a walnut-sized baboon heart into Stephanie Fae Beauclair's tiny chest, making her the first infant to receive a cross-species heart transplant. Amid protests from animal-rights activists, Americans hung on every thump of her simian heart for three short weeks. When her weakened body went into kidney failure and finally gave out, Bailey vowed to try again. "We are remarkably encouraged by what we have learned from Baby Fae," he said. For much of recorded history, many doctors saw the human heart as the inscrutable, throbbing seat of the soul, an agent too delicate to meddle with. After a few incremental advances, that changed on a wide scale with World War II, when massive carnage forced military doctors to experiment with anesthesia and the other elements of modern surgery. Dr. Dwight Harken, a young Army surgeon, managed to remove shrapnel and bullets from some 130 soldiers' chests without killing one. Buoyed by such successes, in the postwar years surgeons made rapid advances in heart treatments. But they struggled to perform operations that lasted longer than four minutes, because the interruption in circulation caused brain damage. That changed in 1953, when Dr. John Gibbon Jr. of Philadelphia used a heart-lung respirator to keep an 18-year-old patient alive for 27 minutes while he repaired a hole in her heart, paving the way for open-heart surgeries to enter widespread use. By the 1960s, surgeons were ready to tackle hearts too far gone for repair. In 1964, a team of surgeons in Jackson, Miss., performed the first animal-to-human heart transplant on record, placing a chimpanzee's heart into a dying man's chest. It beat for an hour and a half but proved too small to keep him alive, a failure that revealed surgeons would have to use human hearts if transplants were to achieve enduring success. By 1967, at least four surgeons were poised to try. On Dec. 3 Dr. Christiaan Barnard of South Africa got there first, sewing the heart of a young woman killed in a car accident into the chest of a middle-aged man. After nearly four hours of surgery, a single jolt of electricity started it beating. "Christ," Barnard said. "It's going to work." And for a while, it did. The patient survived the operation, but the immunosuppressant drugs used to keep his body from rejecting the new organ weakened him. Eighteen days after the operation, he succumbed to pneumonia. Still, the fleeting success made Barnard an overnight sensation and inspired surgeons around the world to try their hands at working the same miracle. Within two years, more than 60 teams had replaced ailing hearts in some 150 patients. But keeping a patient's immune system from turning on the new organ often required large doses of immunosuppressant drugs that left patients vulnerable to deadly infections. Eighty percent of transplant recipients died within a year. Surgeons grew discouraged; by 1970, the number of transplants had plunged to 18, down from 100 just two years earlier. One of the few doctors who kept trying was Stanford University's Norman Shumway, on whose surgical techniques Barnard had relied. His team of doctors and scientists developed a technique to determine whether a patient's body was gearing up to reject an organ, allowing them to tailor their prescriptions of immunosuppressants. The results were impressive. From 1968 to 1980, nearly 200 heart transplants were performed at Stanford. About 65% of Shumway's patients survived at least one year, and half hung on for five. Inspired by Shumway's success, the world's surgeons got back in the game. There were 172 transplants done in the U.S. alone in 1983, and as antirejection medicines improved in the 1980s, heart transplants grew more common. There were 1,647 in 1988. By 2007, the number had jumped to 2,210, according to the American Heart Association. As of May 2008, more than 85% of patients survived for a year. The success of the procedure over the past three decades has created a new problem: rising demand. With far more patients in need than donors, researchers have high hopes for alternative treatments, including stem-cell therapy or heart pumps. Twenty-five years after Baby Fae, the learning continues. See TIME's cover stories on medicine.